For 30 years contact centre managers have been honing their own operations but have struggled to quantify the cost of failure originating outside of their own span of control. Donna Fluss wrote a book in 2005 describing the power of harnessing the vast information a contact centre sits on and how valuable this can be to a business when it is made available to the rest of the organisation in real-time. Sadly very few companies have embraced this. Organisational silos are to blame, as well as poorly designed technology and processes which create a barrier to the sharing of rich insight. This is where real-time data-mining comes in, using the thousands of verbatim most organisations receive on a monthly basis. Data mining is however nigh on impossible when those verbatim are in the form of sound files. IVR surveys are great as they are the most effective in driving change amongst agents listening to actual customers’ voices given them feedback, but for data mining purposes, we need to add an extra step. Enter automatic transcription solutions and text analytics. Automated transcripts are now very cheap and incredibly accurate (+95% of all words correctly transcribed). Which in turn enables an automated feed of verbatim in text form into a text analytics solution (email and web feedback goes straight in without the need for transcription). Once you have set up some rules on how to segment the data, for example any words associated to digital such as website, navigation, online etc. ends up in the “Digital” segment (we call them buckets or themes), you are ready to start analysing. The creation of rules should not take you more than half a day. If your data comes from a VOC solution, you should also use the scoring the customer gave you to increase the ways of slicing and dicing the data. Finally, you should have a solution that is designed to be clever enough to differentiate between just looking at the word “happy” versus the string of words “I am not happy”. You’re now ready to look at your pre-set “buckets”, but also analyse text based on scores customers have given. 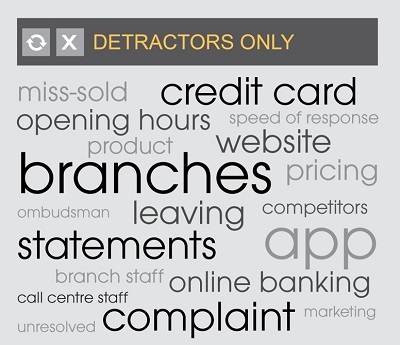 For example looking at a word cloud showing what the key words are for your NPS detractors and promoters. When you click on one of the phrases you will see all the verbatim comments including that phrase in full or, you can create sub word clouds, for example taking a look at what the key themes are amongst detractors having mentioned branches with negative sentiment. One of the biggest indirect costs in contact centres is failure demand. Other departments doing dumb things to our customers that customer service then have to deal with. Using Text analytics, you can create automated “Top 10 gripes” lists that senior management shares with the other departments, thus driving down avoidable costs. We use it to go through current customer pain points with our CEO monthly, then he cracks the whip. When the respective department heads click on one of the gripes, it brings up the all of the verbatim mentioning their disappointment about that area and in Bright’s case, it is linked to the sound file so that they can also listen to the feedback. Website analysis is a good example of something contact centres do not traditionally get involved with. However, the cost of “failure demand” generated online can be enormous and text analytics will help them prove this. As one of our clients put it, “It’s like speech analytics at a fraction of the cost”. There are some excellent examples of speech analytics being used effectively by contact centres but more often than not, those who ‘have’ an analytics capability don’t use it to its full potential. It is often included as part of a wider technology acquisition typically added to a call recorder or dialler purchase and in many occasions, remains underutilised. Another barrier for many has been the cost attributed to this technology typically running into the £100ks for even a small contact centre, which is ten times more than a text analytics solution. Remember to monitor outside your “buckets” for emerging problem areas. One retailer was surprised to learn that after analysing their verbatim comments the word ‘catalogue’ was being used almost exclusively in negative feedback. Following deeper analysis it was revealed that a small section of its customer-base had not received the catalogue which without the ability to monitor customer feedback may have gone unnoticed. Luckily the retailer in question was able to quickly rectify the situation and avoid the loss of sales and reduced customer loyalty. The graph illustrates how phrases relating to waiting a long time or not receiving a catalogue had a negative impact on customer experience. As with the example above, improvements are not just measured as an increase in customer satisfaction, there is also a financial reward when used effectively. Another beneficial area is regulatory compliance. Companies can use this process to avoid costly fines and to prove to regulators that they are proactively analysing customers with low satisfaction scores and resolving the underlying reasons. To find out how Bright can help you set up text analytics please find our contact details HERE. Previous Previous post: Effective customer contact for the utilities sector.